I was in Berlin last week for the Innotrans conference. Berlin’s one of my favorite cities, it’s a very special place – especially when the weather cooperates as it did on this trip. 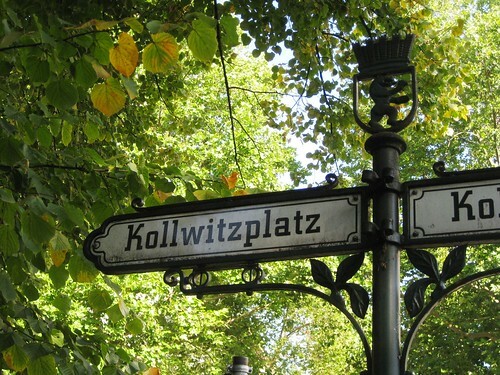 One of the reasons I like Berlin is that I really have learned my way around – 3 one-month long German courses at the Goethe Institute helps a lot. I think I have walked through all the city neighborhoods and the Goethe Institute’s culture program introduced me to the museums and the city’s history. Riding the S-Bahn above the city from Charlottenburg to Ostkreutz is probably the best urban rail experience in the world. You pass all the main Berlin sights including the Reichstag (with its transparent dome), the new government buildings, the fantastic new main train station (Hauptbahnhof), the historic art museums on Museum Insel and of course the Spree River. Many of the stations are works of art in and of themselves: Freidrichstrasse, Hackescher Markt, Alexanderplatz … I could ride this line all day long … but alas, I had work to do at Innotrans. 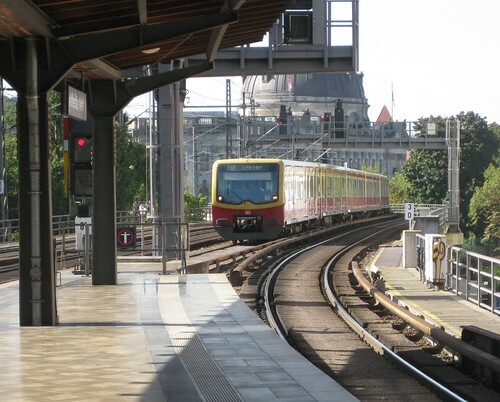 Innotrans is a huge exhibition for all types of public transportation. All the major manufacturers of buses, railway vehicles and equipment, vehicle components, software systems, consulting firms, ticket machine vendors, … you name it, they are there. It’s almost too much, even for a public transport guy like me. The main reason I attended was to help the Rail Technology Cluster Austria (RTCA) with a couple projects. On my trip I returned to several old favorite restaurants and tried two restaurants recently reviewed in the Financial Times – all were great and were a wonderful antidote to public transport overload. I had an appetizer of cold smoked trout served on potato salad with bacon the first night. I enjoyed a really fresh draft Augustiner (Munich) beer with it. The kitchen and bar at Alte Europa (in Mitte) is quite creative and the food is always great. On Tuesday I went to Kurpfalz-Weinstuben (photo above). 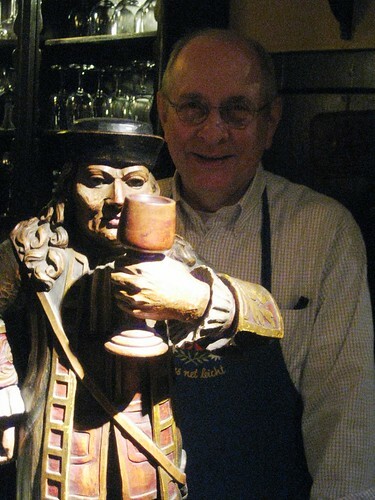 The restaurant has a limited menu because one person, Rainer Schultz (the owner), cooks. I spent a long time discussing the menu with my waitress and finally selected the ‘wild’ soup (wild is meat that traditionally is hunted: deer, boar, etc. and is generally available in the fall). My soup was made with boar and wild mushrooms. It was delightful. Did I mention the wines? 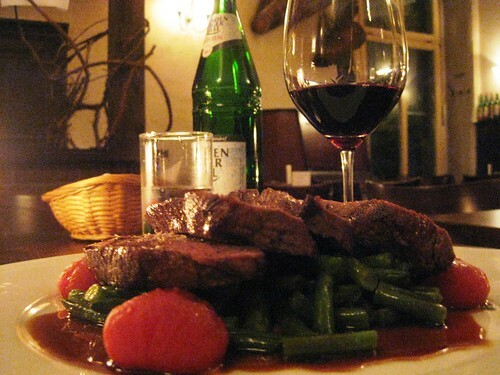 The restaurant is justifiably famous for its wines – they offer probably 50 wines by the glass. I asked my waitress to make recommendations for me, and she did a great job. A very dry Riesling with the wild soup. 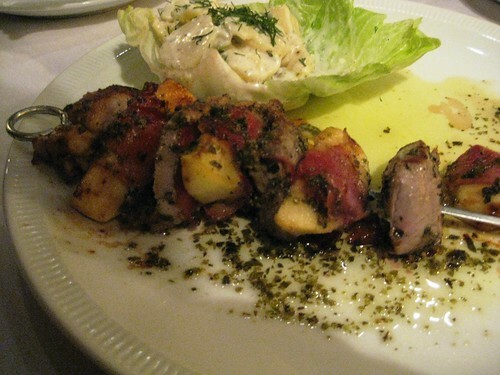 My main course was a kabob of pork fillet and pieces of apple wrapped in bacon (actually Tyrolean dried ham). The meat had been marinated and was as tender as could be. It was served with a potato salad made with apple cubes and tiny diced pickles. I don’t like heavy potato salads, but this was incredibly light – Chef Schultz told me he made it with creme frache instead of mayonnaise. I was bad and asked if I could taste the sauerkraut (a side dish that accompanied one of the other main courses). My waitress brought me a large bowl full and it was wonderful: very light and fresh tasting, not at all sour, again, home made. That’s Herrn Schultz in the photo below. I ended the meal with honey parfait which was the perfect compliment for all the food and wine I enjoyed. Kurpfalz-Weinstuben is a wonderful place. My meal with wine was about 45 Euros without tip. On Wednesday I returned to a place in Mitte called Schwarzwaldstuben. I actually lived on the third floor of this building on my last Goethe Institute course, so I had eaten here several times. They specialize in cooking from the Black Forest (in German: Schwarzwald) and also have Rothaus Beer from the region. I had the lunch special shown in the photo above, Wild Goulash – goulash made from deer meat – that was perfectly cooked and seasoned. 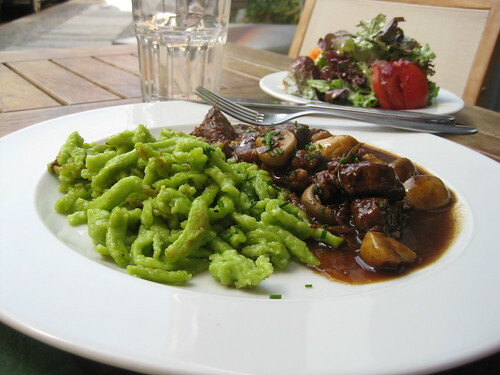 It came with green Spätzle – perfect for soaking up the wonderful goulash sauce. That evening I went to another restaurant recommended in the FT: Weinstein. 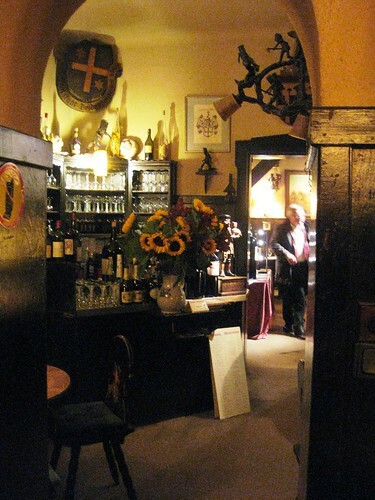 It’s located in Prenzlauerburg and is also a wine lover’s paradise. One of the nice things about this restaurant is that if you order three courses they give you free mineral water and coffee, so I ordered three courses! I started with celery soup: bright green with little bits of sausage in it. It went perfectly with the Pfaz wine recommended by my waiter. My main course was deer fillet served on top of a bed of green beans (which were cooked with bacon and onion) surrounded by four oven roasted cherry tomatoes (at the corners). The meat was so tender you could cut it with your fork and the vegetables were cooked well enough to stand up to the meat. Incredibly, the recommended wine was a Ridge Lytton Springs Zinfandel … my favorite California Zin from my ZAP days in San Francisco … served by the glass! You know what I drank. 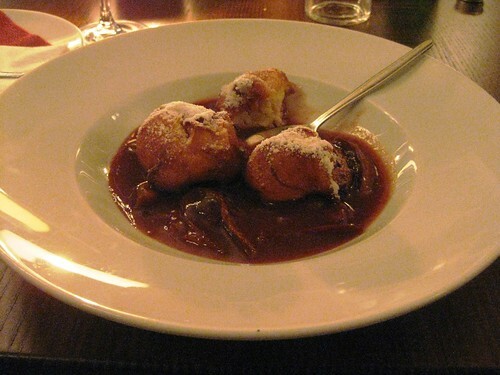 Dessert was mini quark cakes in a compote of plums marinated in cinnamon. The quark cakes were little balls, light as a feather, served warm in the bowl full of compote. Yum. The recommended wine was a sweet German Riesling from the Mosel region, and while I am not normally a sweet wine drinker, the waiter said it was really worth trying, and he was right. While sweet, it also had a touch of mineral taste that gave it more depth than many sweet wines I have drunk. My meal cost about 52 Euros without tip. Weinstein also has a tasting menu on Monday to Wednesday that lets you try small portions of their seasonal menu, perhaps I should have done that since everything I ate was superb. The price for the tasting was 36 Euros (without wine and tip). I needed to fly through Zürich on my way back to Vienna, and our flight was quite delayed leaving Berlin. 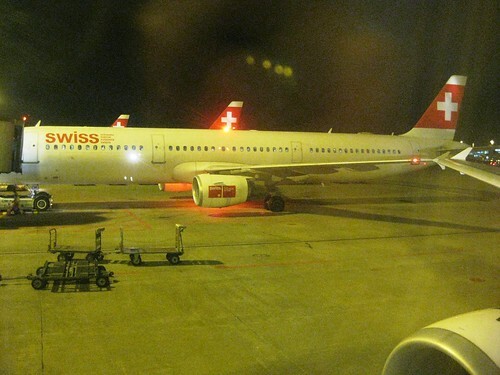 But, I just caught my flight from Zürich to Vienna (I was one of those guys running through the airport and they closed the door right after I walked on – thanks Swiss!) and arrived at home to ask Christa when we can go to Berlin for a holiday. Nice recommendations! After InnoTrans, we ended up at the Umspannwerk Ost, another decent place. And it was good to see the S-Bahn back to full service (more or less…).